So they did, and here’s their dream. Some of the finest players to have ever graced the English game have been resurrected and are now mixing with the talent of today in a bid for European and World Cup glory. 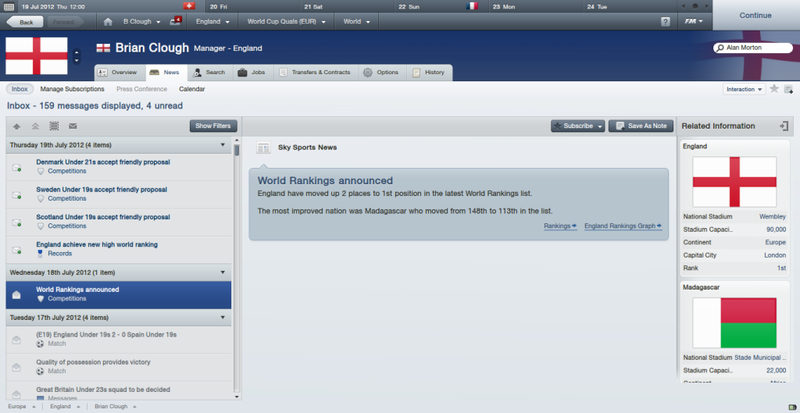 Have been brought back to life to set about making England the number 1 team in the World. To cap it all, they’ve done what previous FA bosses could never contemplate. Clough’s first match in charge will be a friendly at home to Netherlands next month, before Euro Championship Qualifiers against Bulgaria and Wales in September. The only potential spanner in the works for England is that other FAs around the world have been so impressed with the idea that they’ve copied The FA’s plan and introduced their own legends. This could be one almighty European Championships in 2012 with players such as Cruyff, Gullit, Nedved, Figo, Rossi, Charlton, Moore and Klinsmann all potentially competing at the same tournament. 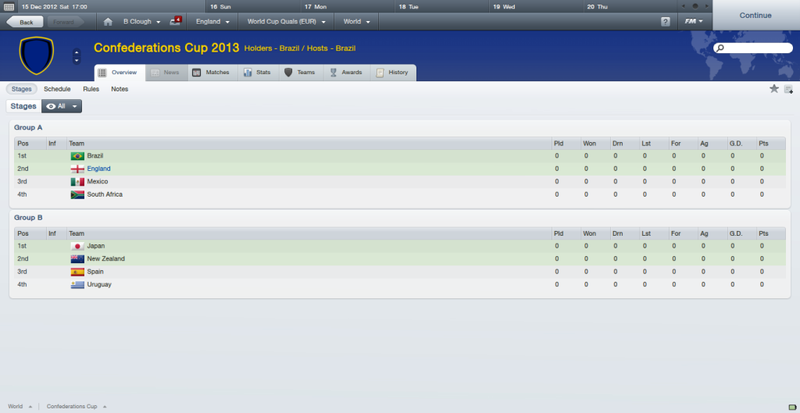 The final games in Group A and this has particular interest for England. Having won Group B, England will meet the runners-up in this group. After two matches, Russia lead the group with 4pts, Denmark on 3pts, Holland on 2pts and Ukraine on 1pt. This is a very close group with any of the 4 teams capable of qualifying for the Quarter-Finals. Johann Cruyff with another two goals to bring his tally to 4 in the tournament so far. In Kharkiv, Russia and the co-hosts, Ukraine met. 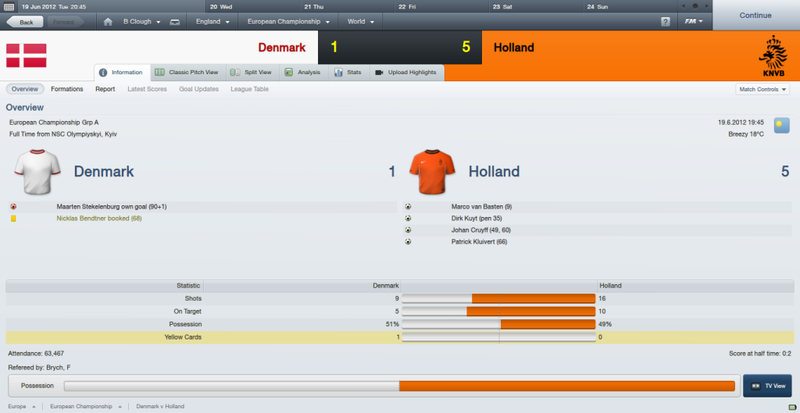 Russia had already thrashed Denmark, 4-1 and drew with Holland. 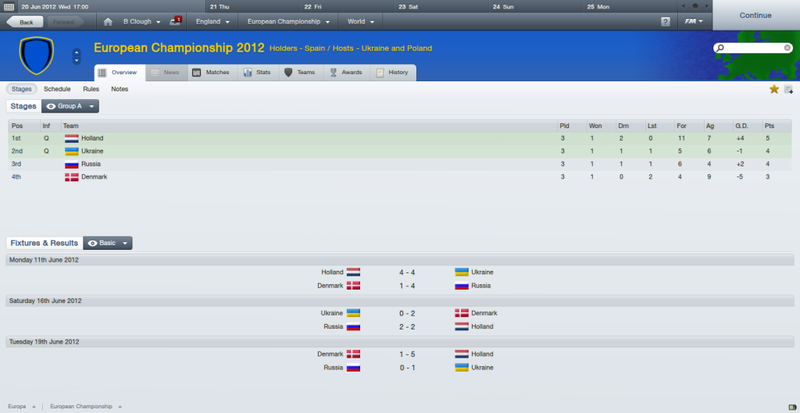 Ukraine had played out a great 4-4 draw with Holland, but lost to Denmark. Russia just needed a draw, and it looked like they’d get it until Sergiy Kryvtsov grabbed a 90th minute winner for Ukraine and, in the most dramatic circumstances, Ukraine end up 2nd in the group. Tomorrow, Groups C & D are sorted out, with Scotland needing to beat Spain to try and qualify. 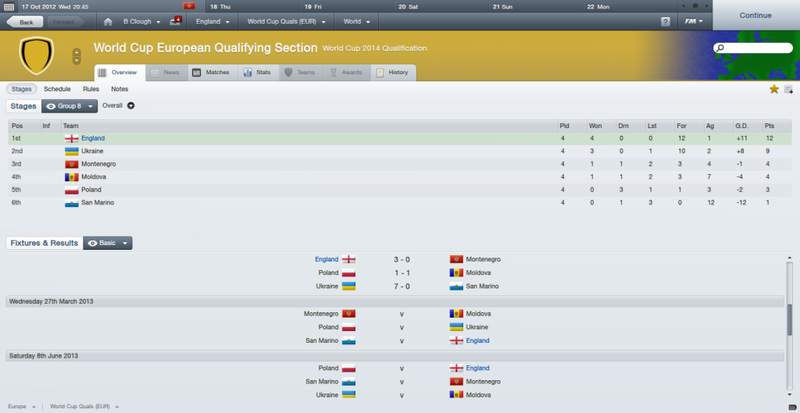 Final group matches, and in Group C we had one of the more remarkable international matches in Lviv. Germany, already knocked out for losing to Portugal and Turkey, were up against Italy, who themselves had only picked up 1pt so far. France were up against Croatia, knowing that they were already through. A cracking match ended up all square at 3-3, although it took a goal in injury time from Luca Modric to give Croatia their only point of the competition. In Gdansk, Scotland and Spain played out a 0-0 draw. Scotland needed to win, and so end up with an all too familiar story in major championships, they went out on goal difference. So here is the Quarter-Final draw. Some shockers there with Germany and Italy, and I am quite surprised at Russia not making it as well. 1988 winners, Holland were up against the 2004 winners, Greece in Donetsk. Greece were down to 10-men, midway through the 2nd half, but the game went into extra time. 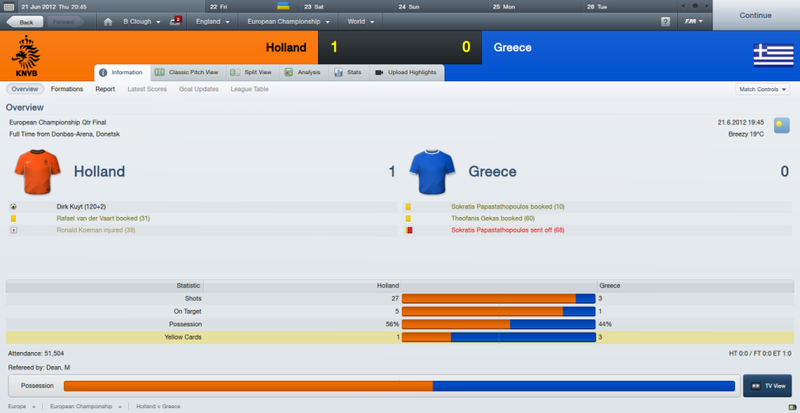 Just as penalties seemed certain, Dirk Kuyt scored 2 minutes into injury time. 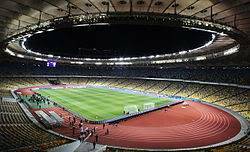 Here in Warsaw, England are involved in the Quarter-Finals of the European Championships. They meet, co-hosts, Ukraine, who got through thanks to their last ditch goal against Russia. Clough reverted to his full strength side as all yellow cards gained in the group stage, were wiped clean. 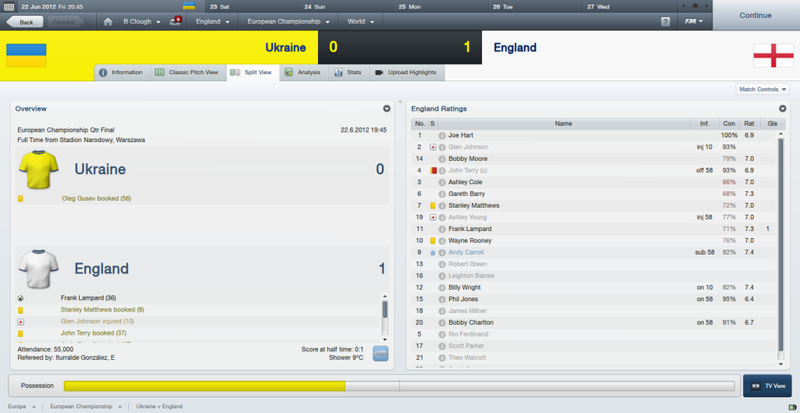 England were buoyed by their 3-1 win over Ukraine in May. Ukraine were desperate to give their supporters something to cheer about, as they’ve never progressed this far in a major tournament before. The breakthrough came with less than 10 minutes to go in the first half. Carroll crossed the ball and Frank Lampard was on hand the whack the ball passed the Ukrainian keeper. England will now wait to see who they meet in the Semis, it will either be France or Portugal. England will feel they owe both countries a good hiding, after the 2004 Euros and the 2006 World Cup. You are picking up some bookings there. You dirty bugger !!!! Spain had to work hard to get past Turkey in Kiev. 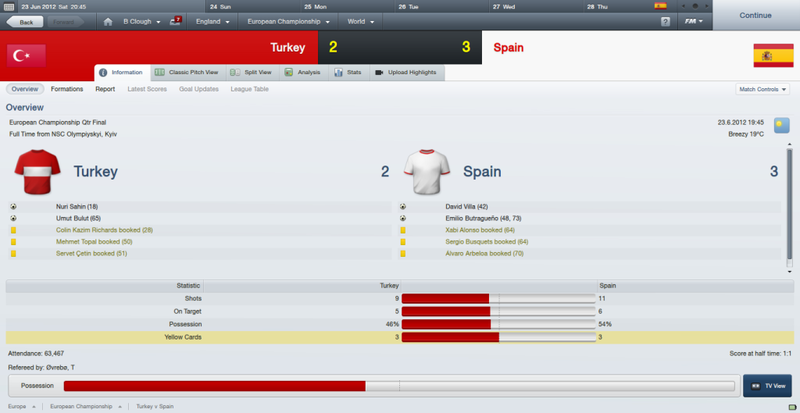 Nuri Sahin put the Turks in front, but then David Villa equalised just before half-time. Three minutes into the second half, Emilio Butragueno put Spain in front. Turkey equalised again, before Butragueno grabbed his 2nd of the game, and what proved to be, the winner. Spain will now go through to meet England in the Semi-Final, in a repeat of the 1996 Euro Quarter-Finals. 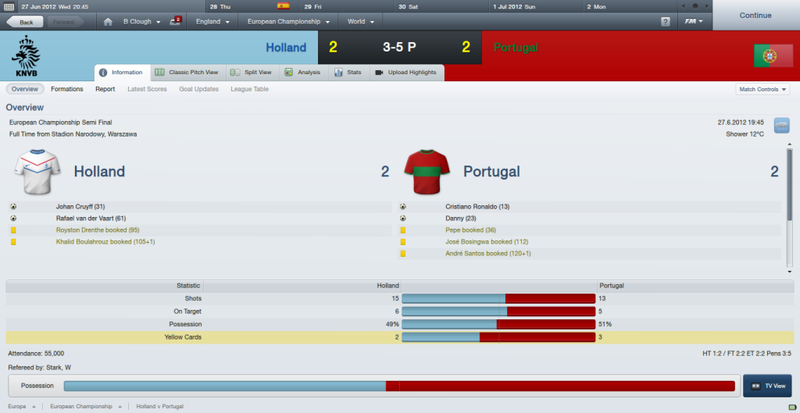 France were beaten for the first time in the championships as Portugal march onto the next round to meet Holland. England went into their 2nd ever European Championship Semi-Final, with dreams of going one better than 1996. Clough was having to shuffle his pack very carefully. Glen Johnson had picked up an injury, John Terry was suspended for his red card against Ukraine. Three players were now on yellow cards, Matthews, Carroll and Rooney. Another card in the Semi would mean they’d miss the final if England got there. Spain, had been less than impressive on a number of occasions during the tournament. Early in the first half, Rio Ferdinand picked up a knock. Clough decided to keep him on in the hope he could shake it off, but Butragueno was starting to get the better of him too many times. England got to half-time still 1-0 up. Spain’s close passing was finding a way through England’s defence, but Hart had made several saves, although the Spanish finishing could’ve been better. Clough decided to bring on Phil Jones for Ferdinand at half-time. He went to right back with Billy Wright switching to centre-back. 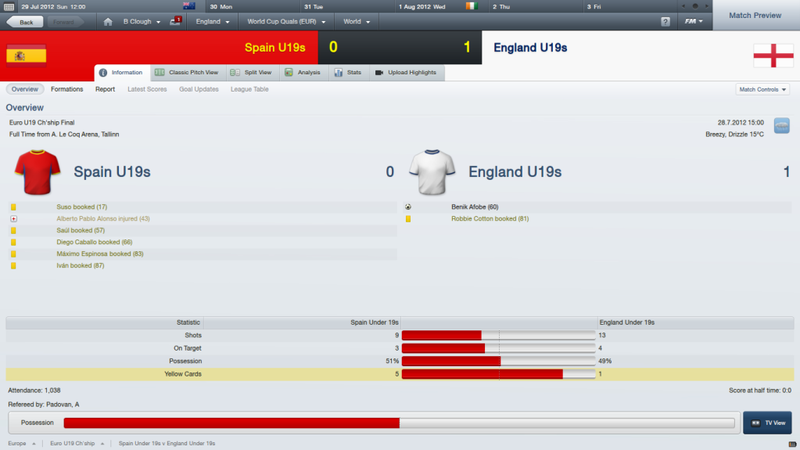 England were really tight in the second half and Spain had few chances. Then Rooney picked up a yellow card. This meant if England could hold onto their lead, he’d miss the final. Rooney was rarely effective and with Jimmy Greaves back from injury, he was brought on to test the Spanish defence. In the end, England made it and Spain failed to retain their title and now England will meet Portugal in the final. It’s only England’s 2nd ever major final, and we all know when the other one was. Tomorrow, England take the field for what is only their second major final in their long history. Their opponents, Portugal, are also in their second major final. The only difference between them is that England won their final, Portugal lost theirs. Both countries are competing in a final away from home for the first time. Few predicted this final. Spain, Holland and Germany were all favourites. Many people believed Spain could become the first nation to retain the European Championship. England and Portugal can be proud in that, between them, they put out the three favourites, rather than find themselves in the final by default, after the favourites all knocked each other out. 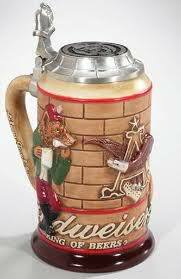 Germany floundered in Portugal’s group, and Holland were beaten in a shootout by them in the Semis. 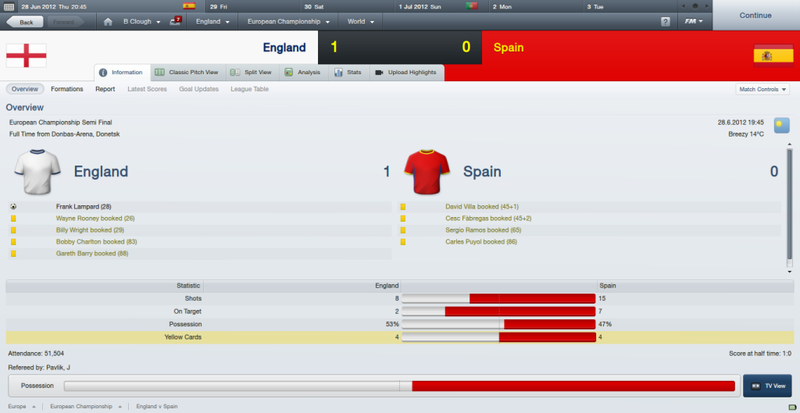 Spain, were closed out by a determined and disciplined England in the other Semi. For England’s manager, Brian Clough, this is a poignant event particularly as he only took over the reins last summer. Already accumulating an impressive record, Clough has lost just once in 15 matches. A 73% winning record is certainly something to be revered, but the one aspect of England’s play under Clough that has been most impressive is the defensive record. Just 10 goals against in 15 matches and still yet to concede during this tournament, Clough has built a defensive attitude that has been the cornerstone of their success so far, over here. England have only conceded in just 6 of those 15 matches since Clough took over. One of the star performers in Clough’s defence has been goalkeeper, Joe Hart. He now has more clean sheets than goals conceded, since last summer, and his saves against the Spanish, finally wore down their ambition. The other cornerstone of England’s defence has been their full-backs. Glen Johnson and Ashley Cole have been consistent performers. Cole gained his 100th cap for his country when he played in the Quarter-Final against Ukraine, Johnson is fast approaching his 50th. Those 3 players are from a group of 7 who have been chosen at least 10 times by Clough. Barry, Matthews, Young and Rooney are the others. Unfortunately, neither Glen Johnson or Ashley Young are fit for tomorrow. Clough has not been afraid to choose youth. Stanley Matthews, Bobby Charlton, Jimmy Greaves, Bobby Moore and Billy Wright, have all been given their chance at international level, and all have grabbed the opportunity. Moore and Wright may well be the defensive partnership tomorrow, with Phil Jones slotting in at right-back. But England will have to take part in tomorrow’s final without Rooney. Ordinarily, that would trouble many a team, but England’s talisman has gone 394 minutes without scoring a goal, after he got the 2nd goal against Poland in the opening match. Clough’s formations have resulted in greater responsibility being taken by those arriving from midfield. Frank Lampard’s goals in the two knock-out ties have been crucial. Andy Carroll and Jimmy Greaves will be given the striking role. The concern will be whether they can last 90 minutes and if not, who will come in? Charlton? Walcott? Of course, Clough could decide to play with just 1 up front, and that would open up the opportunity for Walcott or Milner to come in on the left. 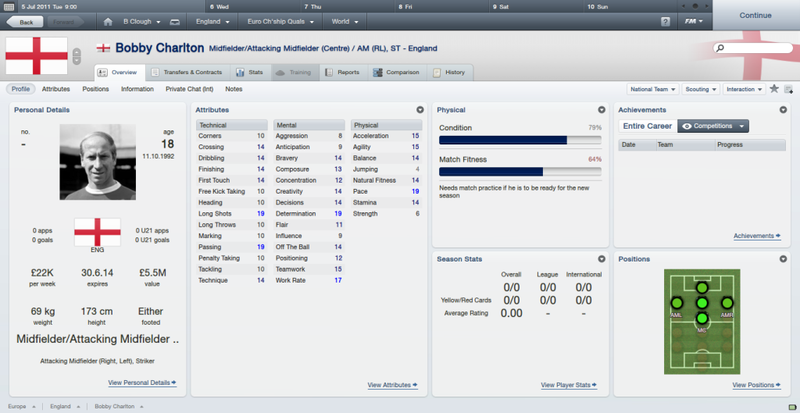 Charlton did a really good job in the Semi, but he may be needed in the centre. After 3 weeks of football, England appear to look as if the final has arrived just in time, one more match and they would’ve run out of players. Portugal have arrived at the final by stealth. Ranked 9th in the world, they began the tournament with a fine 3-1 win over Germany. Two goals from Ronaldo got them on the road, but then a 1-1 draw with Italy and 0-1 defeat to Turkey, hardly had them as overwhelming favourites. 20 year old, Fernando Peyroteo has been a revelation, and his goals against Germany and France, in the Quarters, have gone a long way to helping Portugal reach this stage. He has been joined by another 20 year old, Eusebio. Although yet to score, his contribution to the attacking threat has been considerable. England are going to need to concentrate, but Portugal are going to have to succeed where Spain and France, to name but two, failed. The last two finals were settled by a solitary goal. Prior to that, every Euro final had at least 2 goals. Given both teams form going into this match, it would seem likely that one goal could be enough. I don't know what England would do without Joe Hart in goal (IRL) and even then he gives me jitters sometimes. Those youngsters are developing quite nicely, should be household names for many years to come. Frank (Who ate all the pies) Lampard is the man for England, you just can't rule him out of any game. Good evening, from a wet and breezy Olympic Stadium in Kiev. We’re here, of course, for the final of the European Championships, between England and Portugal. This stadium holds 70,000 and was built in 1923. It’s had several names over the years, such as Trotsky and Krushchev, but they’ve settled on the Olympic Stadium, although Alan & I were trying to rack our brains to think when they had an Olympic Games in Kiev, but then Mark put us right and explained they intend to bid for the games. Anyway, enough of the history & politics, we can’t wait for things to get underway here. There’s been much speculation about the two sides too. England has Rooney suspended, Johnson and Young are both injured, but Steven Gerrard is back from suspension and the big question is how is Clough going to set his team up tonight. Alan, any clues? AH: No, I mean, we’re talking the biggest game any of us can remember, and England seem to be on their last legs. This final hasn’t come soon enough. Will Gerrard play? Will Charlton continue on the left, will it be 4-5-1 or 4-3-3? Gosh, so many things to try and work out. Well, thanks for that insight, there Alan. Erm, Portugal too have their problems as Joao Pereira is suspended and we’re not sure whether they’ll play with 3 up front or not. ML: yes, that’s right, Gary. In the Semis against Holland they played with Eusebio and Ronaldo up front, but in the Quarters against France and if you think back to the Germany game, they had Peyroteo up there with Eusebio, and Ronaldo just behing. It’s likely they’ll go with 4-1-2-1-2, but just who will play where, is uncertain. Where will England need to be careful? AH: Probably out there, Gary, I mean that’s where the action’s gonna be and that’s where I’d be telling the players to keep their wits about them. ML: haha, no England are going to have to be careful with the threat from Ronaldo, or whoever comes from deep. Gareth Barry will have a tough job, but he’ll have played against Ronaldo before, so he’ll know what to expect. AH: Yes, and the two in midfield, Joao Moutinho and Raul Meireles present a threat too. They like to get forward. One area they could be suspect is out wide. If England can keep their full-backs busy, then they can’t bomb forward. But I don’t know if I fancy their centre-back, Carvalho, I mean he’s nearly as old as you, Gary. Er, not quite, but that’s a good point, although him and Pepe are very experienced and both Real Madrid players so have formed a good partnership. But can England be sure of that? I mean, we don’t know whether Terry or Ferdinand will play, or whether he’ll just go for Moore and Wright. That would be a real gamble, wouldn’t it? ML: yes it would, Gary, but they have pace about them and both have performed well in this tournament. They can score goals too. Yes, but Terry and Ferdinand have almost 160 caps between. Whereas Moore and Wright have 18. Is he really gonna just ditch his most experienced players? And what about right-back, who comes in for Johnson? AH: I reckon he’ll go for Jones. I like him, he can play anywhere, and has fitted in well. 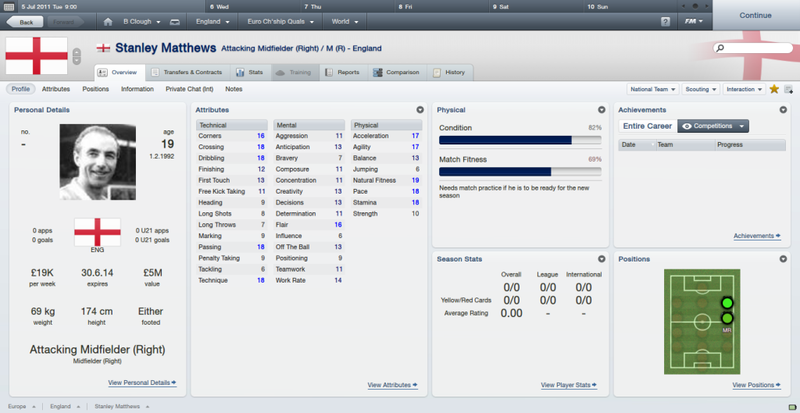 There is the option of Wright at right-back and Moore and Ferdinand in the middle. AH: I don’t think so, no. ML: it’s just injuries, Gary. I’m not too concerned, as I think we’ve got a real competition for places now and that’s really healthy. I wouldn’t be too concerned about the two youngsters coming in. One reason for Ferdinand is that he played with Ronaldo and so he should know all about him. Ok, well thanks lads. Next up we’ll have the line-ups. Don’t go away. Bring in the youngsters, they will pull through for the team. Welcome back. 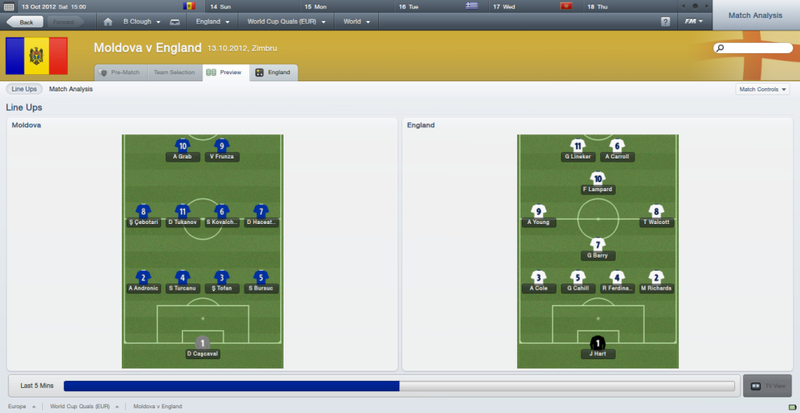 Well there’s been much speculation about how England are going to line-up. They’re without some key players, like Rooney, Ashley Young and Glen Johnson, and we’ve been debating whether Steven Gerrard will come back straight into the starting line-up or whether he’ll be on the bench to begin with. 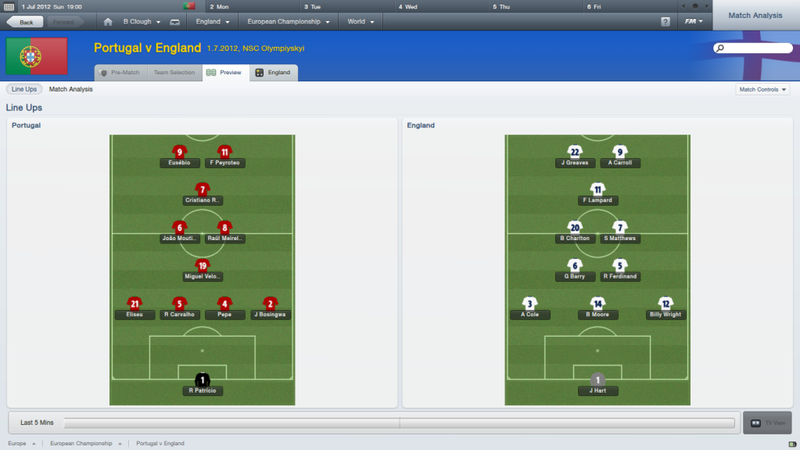 Well, we can now reveal the team England will start with in this European Championship Final 2012. So then chaps, Ferdinand is in, Gerrard on the bench, and England go with Greaves and Carroll up front. Surprised?. ML: Erm, I like the tactic, to be fair. I think he could’ve gone really defensive, butI think we’ll see Ferdinand play as a DM, alongside Barry and then have 3 at the back. If England need to revert to a more defensive formation, then Ferdinand to slot in next to Bobby Moore to keep things tight. Yes, and just think of Bobby Charlton, Bobby Moore, Billy Wright, Stanley Matthews and Jimmy Greaves. This time last year they weren’t even in the England squad and now they’re not only in the squad but they’ve made the Final starting 11. England played pretty well in the first half and created several chances that could easily have broken the deadlock, but didn’t really trouble the keeper enough, did they Alan? AH: No, Portugal were prepared to just sit and defend and England had to work hard to create anything. Greaves went close, Charlton was involved in plenty, but Andy Carroll was a little too quiet for me. ML: Yes, I only remember one chance that Portugal had in the first half, as England controlled the game, but as Alan says, England struggled to really create anything that would worry the Portuguese. Yes, Greaves had a chance, Lampard hit a shot over the bar from outside the area. What will worry England is that Portugal kept knocking the ball over the defence for Eusebio and Peyroteo to run onto. It forced Clough into making a change and he moved Ferdinand into defence. Half-time and no score. This is tense. What will the second half bring? Into the second period and still things were tight, but it was now Portugal who were more creative, but England defended well and Hart didn’t really have too much to do. Just after the hour, Clough made his first change bringing on Theo Walcott for Andy Carroll. AH: Yeah, Carroll had struggled to make an impact and so England were now going to attack Portugal with pace. ML: Quite a good move, actually. Portugal were pushing forward and committing more men to attack and so there were gaps in their half that a player like Walcott could exploit. 15 minutes to go, still no score and on came Steven Gerrard. Frank Lampard made way and England needed some magic from the Liverpool captain. The game looked to heading for extra time, as Portugal continued to press England, and then Bobby Moore picked up the ball inside his own area and played a telling pass right to Theo Walcott who’d found space. AH: What a moment for the boy. Great run by Walcott, although I thought he should’ve headed for the goal rather than the bye-line, but a great pass and Greaves was there to supply the finish. ML: Yes, if you watch that footage, just look for the run of Jimmy Greaves. He really bust a gut to get into the area and leaves the defender for dead, Walcott just needs to get the ball into the area and Greaves finishes superbly. Yes, a fantastic moment and England has won the European Championships 2012. What a moment. I think we can now hear from the victorious England manager, Brian Clough. I: Brian, congratulations. What a great finish and you must feel somewhat vindicated by your team selection? 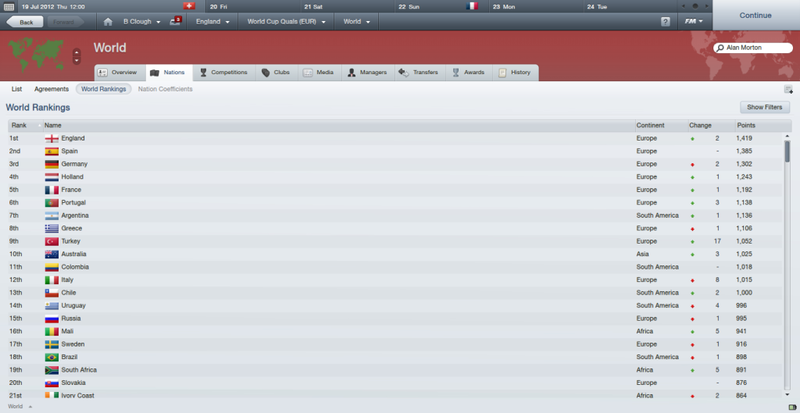 I: erm, how does it feel to be the first England manager for 46 years to win a major trophy. BC: Well, it’s good but this is only the start. There are some fantastic players in this team and players who will be around for many years to come. We are on the brink of a revolution. I: Theo Walcott made a real impact, should he have been on at the start? I: Erm, well given the way his pace was too much for the Portuguese defence, could he have caused them more problems if he’d had more time on the pitch. BC: Listen, young man. When you’ve played the game like I have and managed teams and players then you can perhaps suggest that I got it wrong. Walcott’s pace was ideal for that point in the game. They got used to a big man up front, but Walcott gave us something different. That was the plan. I: Excellent. Well, on behalf of England fans everywhere, thank you to you and your team for the enjoyment throughout this competition. Yes, Brian Clough in typically calm mood. England has created history here in becoming the first team to go through a major tournament without conceding a goal. Joe Hart has set a record of 6 games, 6 clean-sheets. The celebrations can now begin and England can look forward to an open-top bus tour around London. Brilliant and who is to argue with Cloughie ? Next stop for England, World Cup !!!! 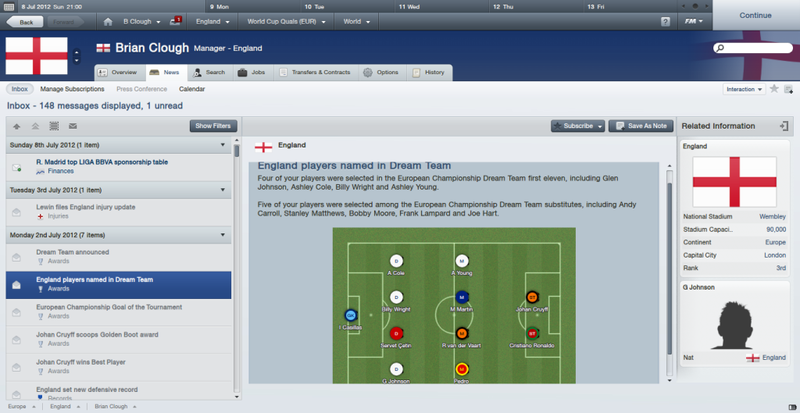 Three England players make it into the Dream Team, with a further 5 selected amongst the subs. Then comes the news that every England fan has been dreaming of for years and years. 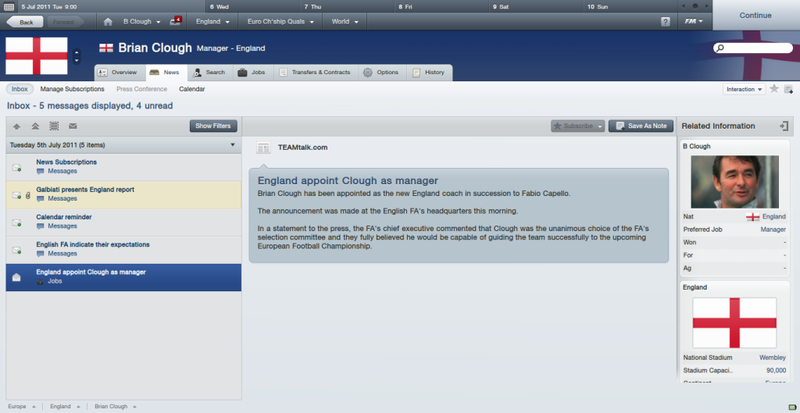 After winning the European Championships as England manager, Brian Clough now moves to his next task. Manager of Great Britain in the Olympic Games. Clough has scoured the British Isles and selected the cream of young talent, ignoring the clamour for including players like David Beckham and Wayne Rooney. Oh my, what a team !!!! Surely they are unbeatable ? 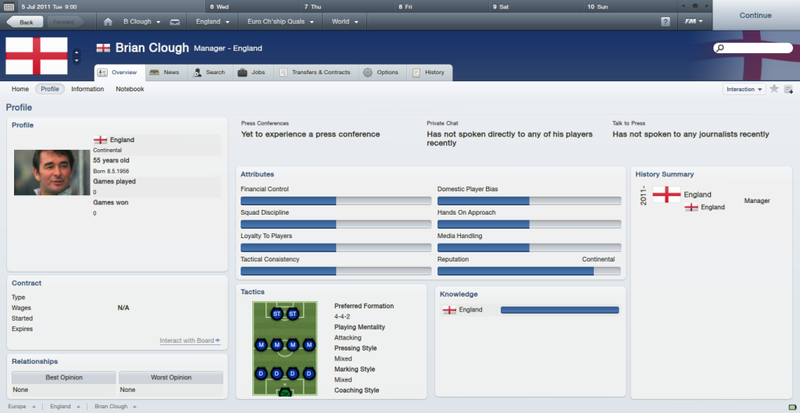 Brian Clough has taken charge of the Great Britain team for the 2012 Olympics. 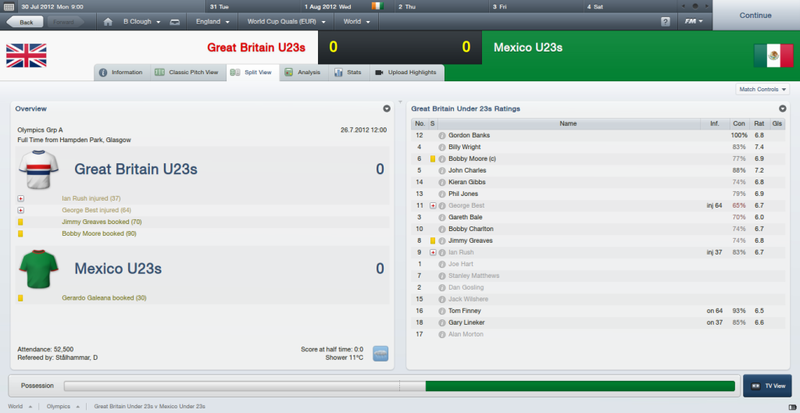 GB opened the tournament against Mexico. A rather disappointing performance. 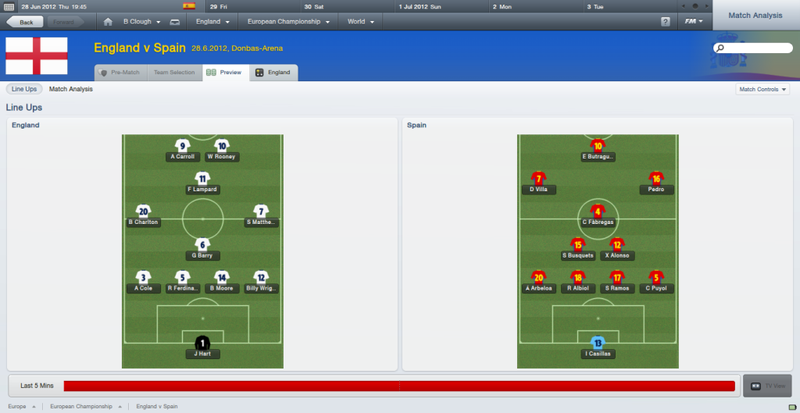 This set up a Semi-Final clash with Spain. Two goals from Phil Jones and another one for Gary Lineker and a penalty from Jack Wilshere, gave GB a convincing win over Spain. Don't think anyone would have picked Mali to be in the final !!!! Brian Clough’s Great Britain side won Gold at the 2012 Olympics with a crushing win over Mali at Wembley. In front of 90,000 fans, the home side were dominant throughout, as they have been all tournament. It was a personal triumph for Clough, coming a month after he guided England to the European Championships. Clough appeared vindicated in his decision to leave Gary Lineker at home during the Euros. The Leicester City striker looked fresh and firing on all cylinders as he added a further 2 goals to take his total to 8 in the competition. Mali strikers, Garra Dembele and Modibo Maiga were both 1 goal behind Lineker at the start of the day, but neither had a sniff of a chance to add to their tally, as GB’s central defensive pairing of Bobby Moore and John Charles proved impenetrable. Moore ended up with the man-of-the-match award as he got himself on the scoresheet too. No prizes for guessing who opened the scoring, as Lineker latched onto a perfectly weighted pass from Tom Finney. His thunderous finish gave GB the lead inside the opening 10 minutes. Lineker then doubled the lead 4 minutes later as GB ran riot. Two goals up at half-time became 3-0 midway through the second period as Bobby Moore pounced on hesitation in the Mali defence at a corner. Clough then made changes as he brought on Wilshere, Greaves and Morton. Wilshere soon got in on the act as he made it 4-0 with 13 minutes left on the clock. 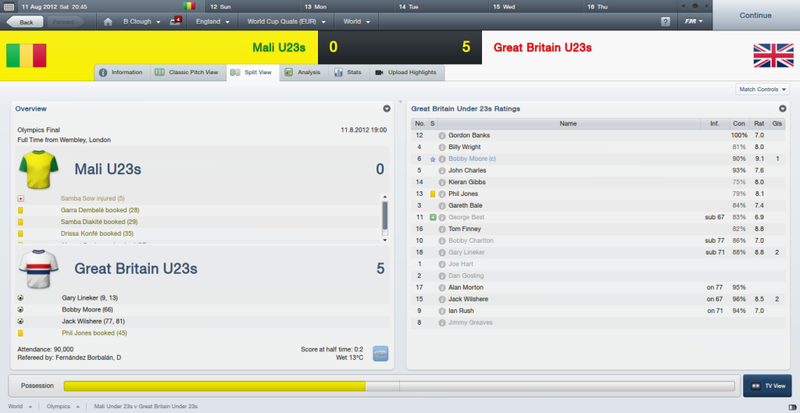 Wilshere then scored again 4 minutes later, and GB were out of sight as far as Mali were concerned. 17 shots to 8 showed how clinical and dominant GB were, as they repeated their 5-0 margin from their friendly before the competition opened. Clough has done a remarkable job with this squad in such a short time together. England’s future attacking options would seem in great shape as Greaves and Lineker have been brilliant over the past month. Greaves scored the winner in the Euro Final in July, Lineker gets 2 in the Olympic Final. Add to that attacking force from midfield that Bobby Charlton and Tom Finney showed, then the defensive qualities for Moore and Wright and the goalkeeping prowess of Gordon Banks and it would look like England has reason to be confident going into the next World Cup. For the other Home Nations, they should feel proud of the contributions that Gareth Bale John Charles and Ian Rush put in for Wales, George Best for Northern Ireland and Alan Morton for Scotland. Football in England is booming at the moment as the England has also won the Under-19 European Championships. Wow, what a thumping, in the final as well, almost feel sorry for Mali. 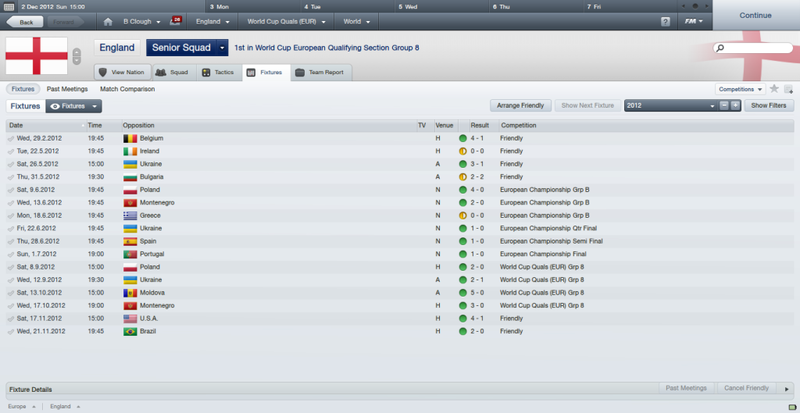 World Cup qualifiers next then for you. Can't see anyone stopping that England side at the moment. England manager, Brian Clough has resisted the temptation of filling his full squad with the players who were instrumental in helping Great Britain to the Olympic Gold Medal last month. He has preferred to leave players like Gordon Banks, Tom Finney and Kieran Gibbs to appear for the Under-21s. However, Gary Lineker earns a call-up to the squad, having been left out of the Euro 2012 squad. This is reward for his 8 goals in 5 games in the Olympics. Lineker is one of just two changes from the Euros squad as John Terry, unavailable through injury, and James Milner is left out. Micah Richards is brought in after an impressive start to the season. England’s World Cup campaign begins at Wembley against Poland on Saturday 8th September. They then travel to Kiev to meet Ukraine, the following Wednesday. England will be confident of their chances, having beaten both countries on their way to winning the European Championships. One big decision Clough has made is the England captain. During his reign, John Terry has been captain with Rio Ferdinand vice-captain. Terry is currently injured and looked to struggle for his place during the summer. Ferdinand, whilst fit, also looked to be under pressure from youngsters, Bobby Moore and Billy Wright. Whilst both Moore and Wright could be future England captains, Clough has decided it’s time for a change. Steven Gerrard is the new England captain and his midfield partner, Frank Lampard is the new vice-captain. Latest news suggests the public perception is positive with this move. Speculation is now rife as to whether this is the end of John Terry’s international career. Rio Ferdinand, although in the squad, will now be nervous of his place against Poland. Wright and Moore performed very well during both the European Championships and the Olympics. Moore was captain of the Great Britain side that won the Gold Medal and he is likely to be groomed for the role within the full England squad. Interestingly, Moore and Wright have been picked by Clough more times than either Terry, Ferdinand or Gerrard, with Wright chosen more times than Lampard too. For Gerrard, this represents a personal triumph. 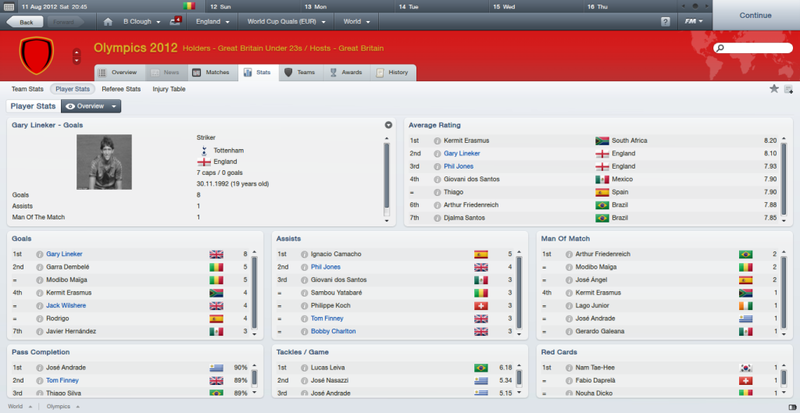 Sent off against Montenegro in the Euros, he didn’t appear until as a substitute in the Final. Insiders are said to believe that Clough was particularly unimpressed by Gerrard’s red card, believing that put unnecessary pressure on his squad. As it is, it allowed players like Bobby Charlton to blossom, and now would appear that all has been forgiven. Gerrard, 3 away from 100 caps for this country, now has the chance to steer his country towards the World Cup in Brazil where they should emerge as one of the favourites. England’s World Cup Qualifying plans were dealt a blow, yesterday, with news from Anfield that Steven Gerrard has fractured his wrist. Latest speculation is that he is likely to be out for up to 5 weeks, which means he will miss both the Poland and Ukraine matches, and could even be a doubt for the trip to Moldova next month. This is a personal tragedy for Gerrard, newly crowned captain of his country, who was desperate to put his mark down on the team. The door is now open for Frank Lampard to step up as captain in Gerrard’s absence. Gerrards injury has lead to an opportunity for Tom Finney. The Manchester City youngster has been moved up from the Under-21 side. Finney, who was a key figure in Great Britain’s success at the Olympics, has been very impressive for his club so far this season. Whether he will play a part in the upcoming fixtures, remains to be seen, but this is his opportunity to show what he can do. England has now taken their unbeaten run to 12 matches. Joe Hart has taken his run of clean sheets to 7 matches. In 14 starts under Brian Clough, Hart has conceded in just 4 of those. 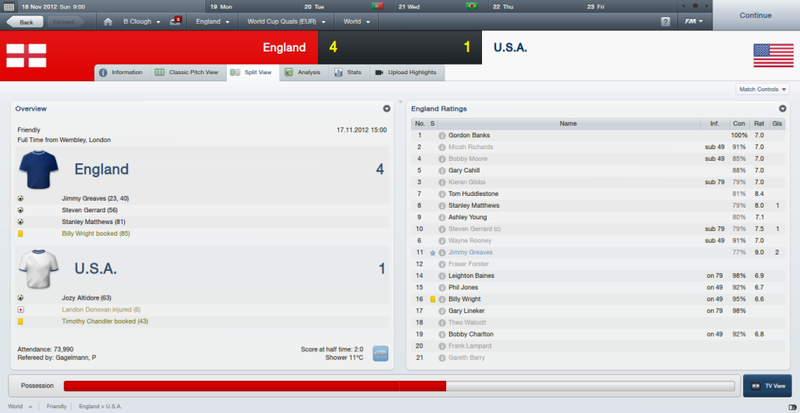 England got their World Cup Qualifying campaign off to the best possible start. Their first match since winning the European Championship Final in Kiev, and you could hardly tell the difference. Frank Lampard was captain of a team which contained 4 changes from the starting line-up against Portugal, as Glen Johnson and Ashley Young were fit again. Gary Lineker, fresh from his success at the Olympics, gained a starting place at the expense of Andy Carroll, and Theo Walcott got the nod on the right, in place of Stanley Matthews, after his fine substitute performance in July. Scorer of the goal that won the Euro trophy, Jimmy Greaves opened his account in this qualifying tournament within 2 minutes of the kick-off. Into the 11th minute and Billy Wright doubled the lead, when he headed in from a corner. England were rarely threatened and controlled the game, squeezing out their opponents who were continually frustrated. So much so, that Poland only managed to get one shot on target in the whole 90 minutes. England now move to the scene of their Euro 2012 triumph as they meet Ukraine on Wednesday. In other matches, Scotland got their campaign off to a terrific start with a 3-0 win over Serbia. Naismith (2) and Caldwell gave them a famous win. Wales, too pulled off a victory to remember, as they thumped Croatia, 5-2 at The Millenium Stadium. Tough news about Stevie G there. Wales, wow, what happened there? Ian Rush is on form ? Brian Clough’s England extended their winning run to 5 matches and their unbeaten run to 15. But they had to rely on some help from their opponents to claim the 3pts. Clough named an unchanged side, which again saw no place for Ferdinand or Rooney. Ukraine proved tough opponents and England struggled to break them down. The first half ended goalless, as both sides cancelled each other out. The second half had barely got underway when Ukraine cleared the ball from their area, and Voronin running back towards his own goal, inexplicably headed the ball back into the area where Greaves was first to the ball. He turned and past to Lineker, unmarked in the 6-yard box and the Leicester City striker couldn’t miss, for his first international goal. Ukraine were probably expecting an onslaught from the European Champions, but it didn’t materialise. As the game moved into the final quarter-of-an-hour, the home side visibly gained in confidence and had their best period of the match. Joe Hart was called upon to make a sharp save low down to his right. The resulting corner saw Voronin redeem himself as the ball bounced like a pinball in the 6-yard box and the former Liverpool striker was on hand to knock the ball in for the equaliser. For Joe Hart it was the first goal he’d conceded in an England shirt, since Bulgaria in May. A run of 7 matches. England now have the perfect start with 2 wins from their opening 2 games, albeit a little fortuitous. Elsewhere in the group, Poland and Montenegro played out a 0-0 draw and Moldova beat San Marino, 2-0. In Group 1, Wales continued their impressive start as a Steve Morison goal in the 2nd minute was enough to beat Belgium, 1-0 in Liege. Scotland travelled to Split but were beaten 1-3 by Croatia, although with 10 minutes left they looked like getting a draw but then the home side scored twice and came away with the 3pts. In Group 3, Ireland won 4-1 in Kazakhstan as Kevin Doyle scored a hat-trick. Then in Group 6, Northern Ireland beat Israel 2-0. You are missing a bit of the story. Who scored the 2nd goal for England? Of course the answer is in the picture, but when I was writing this I couldn't remember how to spell the geezers name so I left it to then write the rest of the story. but forgot to come back to it. But now I know someone reads this I ought to take a bit more care over it! Brian Clough has to name his squad for the upcoming World Cup qualifiers against Moldova and Montenegro. Two wins from the opening two games have given England the perfect start but now Clough faces a real problem of availability for this squad. Billy Wright and Bobby Moore are both injured, as is Bobby Charlton. Glen Johnson and Leighton Baines are also out. That means a whole new back four. Jimmy Greaves and Wayne Rooney both need to prove their fitness too. Steven Gerrard is definitely out, and so Frank Lampard will captain the side again. This could mean a recall for John Terry, or a chance for Phil Jones to step into the important centre-back. 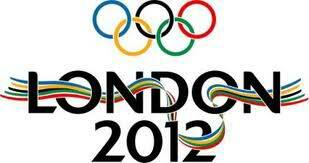 Arsenal’s Kieran Gibbs could receive a call-up, he played well in the Olympics. The same could be said for Gordon Banks who was also very solid as keeper in the summer. Clough has quite a decision to make for the striking positions as Theo Walcott and Andy Carroll have both made good starts to the season. Tom Finney could also play a role, having been in the squad for Poland and Ukraine, but still yet to make his debut. Brian Clough has been forced to make several changes to his squad for the forthcoming World Cup qualifiers against Moldova and Montenegro. Scott Carson and Robert Green have been dropped from the goalkeepers section of the squad, which sees first call-ups for Fraser Forster (Newcastle) and Gordon Banks (Chesterfield). In defence, Glen Johnson, John Terry, Leighton Baines, Bobby Moore and Billy Wright are all injured. Kieran Gibbs (Arsenal) and Phil Jagielka (Aston Villa) have been called up. Gary Cahill (Bolton) has also received a recall. In midfield, Bobby Charlton and Steven Gerrard are both injured. 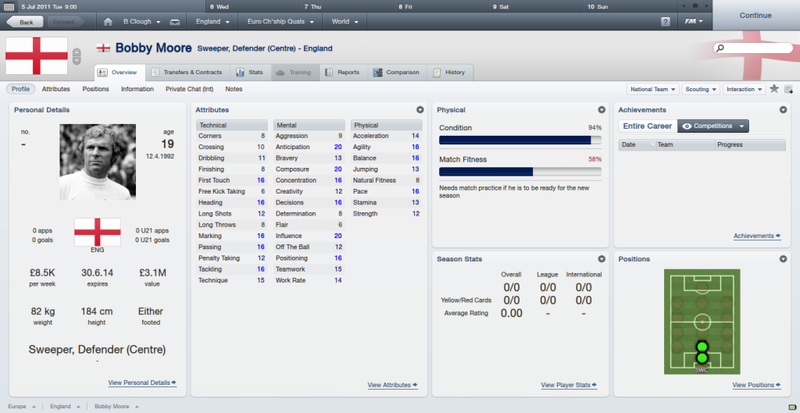 Tom Huddlestone (Tottenham) has been called up. James Milner has been called up, having been in the Euro 2012 squad, but not the last two. Up front, Clough has taken a gamble with both Rooney and Greaves who are both still out injured, but expected to recover in 4-5 days. If they don’t make the Moldova game they should be fit for Montenegro. That could mean an important role for Tom Finney and Gary Lineker. Theo Walcott and Andy Carroll are also retained from the last squad. Tom Huddlestone is quite a beast for England. He is a solid player and will do well for you. England made 4 changes from the side that won in Ukraine last month, as Brian Clough shuffles his pack to deal with a spate of injuries. In comes Micah Richards at right-back for Glen Johnson. Rio Ferdinand and Gary Cahill are in at centre-back for Bobby Moore and Billy Wright. Andy Carroll gets the nod up front alongside Gary Lineker as Jimmy Greaves is still not 100% fit. Wayne Rooney is also not 100%, but he may be available for Montenegro in the week. Things began well for England who were all over the home side. 15 minutes in and Andy Carroll was brought down and the ref had no hesitation in awarding a penalty. Frank Lampard stepped up and made no mistake. His 28th goal for his country and his 5th under Clough. 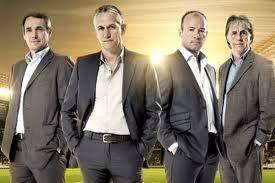 On the half-hour, Lineker, with his back to goal, turned the defender and then thundered the ball past the keeper. 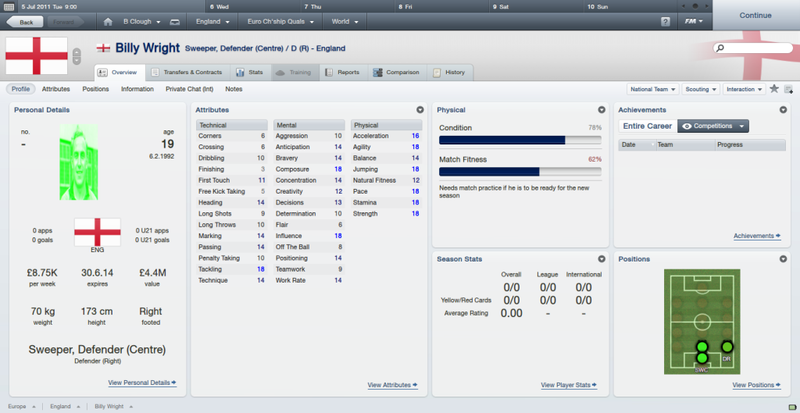 He’s scored in successive matches and seems determined to prove his manager wrong for leaving at home during the Euros. England were more than comfortable at 2-0 at half-time. Early in the second half and Andy Carroll made it 3-0. Midway through the second period and a corner on the right was headed in at the back-post by Rio Ferdinand. Clough used the advantage to make changes and Tom Finney was brought on for his debut. 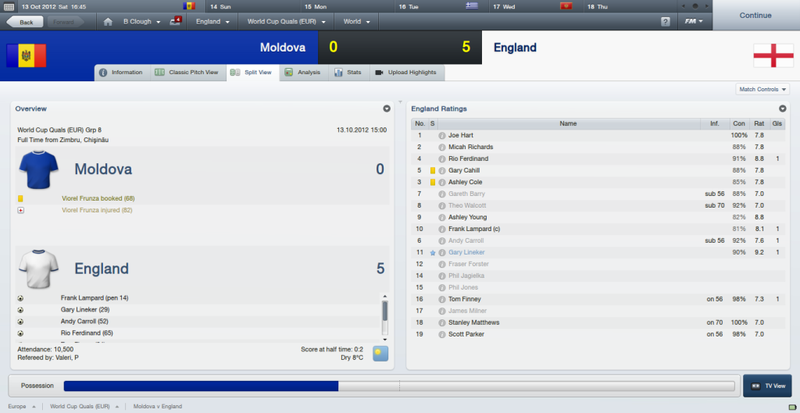 He thanked his manager by finishing a lovely flowing move to give England a 5-0 win. That’s 6 wins in a row and an unbeaten run that now stretches to 16. Elsewhere, Scotland continued their impressive start to their qualifying campaign with a 2-0 win away to Macedonia. In the same group, Wales were held 1-1 at home to Serbia. Wales lead Group 1 with Scotland in 2nd. In Group 3 Ireland were beaten at home by Sweden, 1-2. 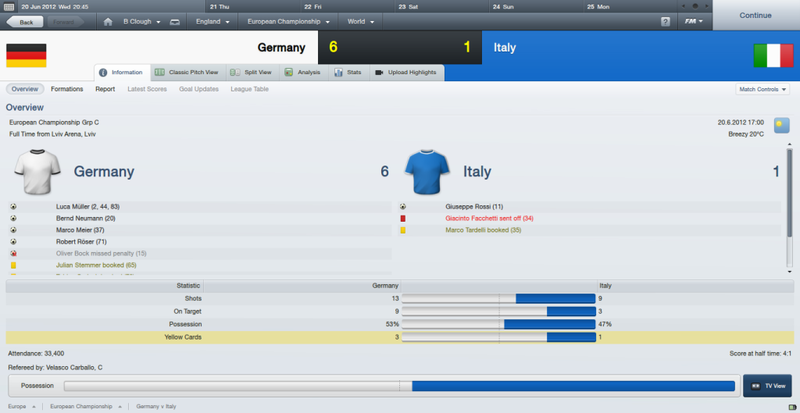 This group also contained the shock of the night as Germany were held 1-1 by the mighty Faroe Islands. In Group 6, two goals from George Best gave Northern Ireland a 2-0 win over Luxembourg. The England joyride carries on. Another match, another win. That’s now 7 in a row and unbeaten in 17. Another clean sheet for Joe Hart. That’s 11 in 16 matches under Clough. England met Montenegro in Clough’s 4th match in charge. 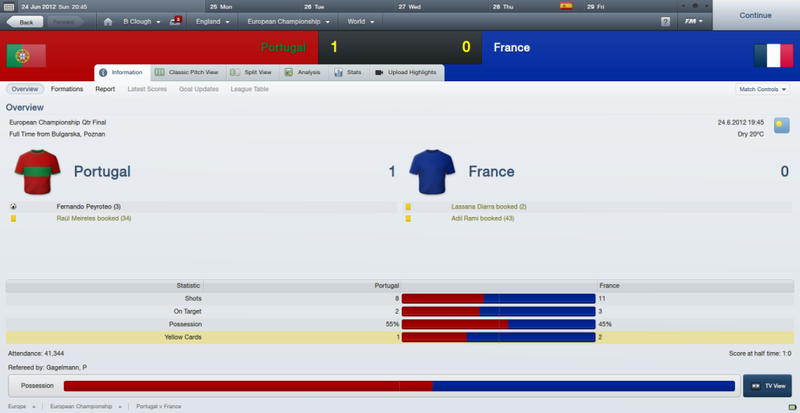 They needed a draw to qualify for Euro 2012. They won that game comfortably, 2-0. 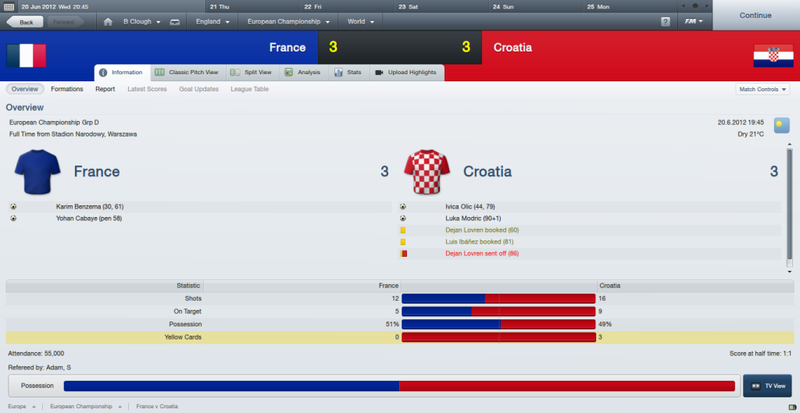 This time they met Montenegro as European Champions, and difference was clear. They passed the ball with confidence, created chance after chance and could’ve won by more than the 3-0 margin, but the 3pts were gained anyway. It took them until just before half-time to open the scoring. Frank Lampard was unlucky not to be credited with the goal as his shot hit Bozovic, but it went down as an own goal. Lampard then hit a storming shot from outside the area two minutes later, and England went into the break 2-0 up. Rooney was restored to the line-up to play alongside Lineker, with Greaves on the bench. Greaves came on as a sub in the second half, as did Matthews and Finney. The quality of England’s squad was for all to see. Pekovic was then sent off before the hour, but the game was already lost as far as the visitors were concerned. In injury time Gary Cahill scored his first goal for England as he headed in a corner. 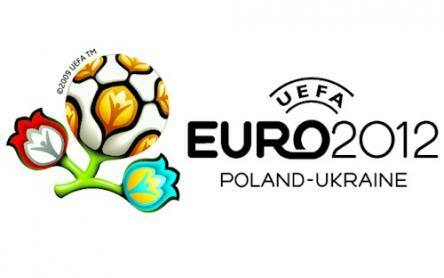 Elsewhere in the group, Ukraine thumped San Marino, 7-0 and Poland drew 1-1 with Moldova. 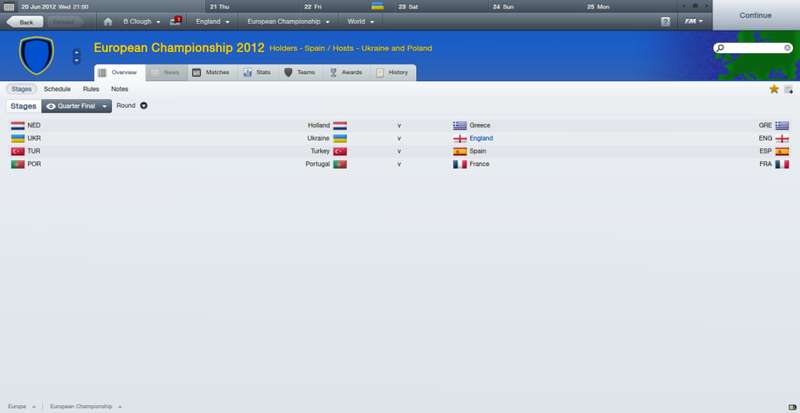 Poland have yet to win in 4 matches so far, and so Ukraine look the only realistic challengers to England. In Group 1 Scotland and Wales played out a 1-1 draw. Group 3 and Ireland were trounced 0-4 in Germany. In Group 6, two George Best goals weren’t enough to stop N.Ireland going down 2-3 to Portugal. 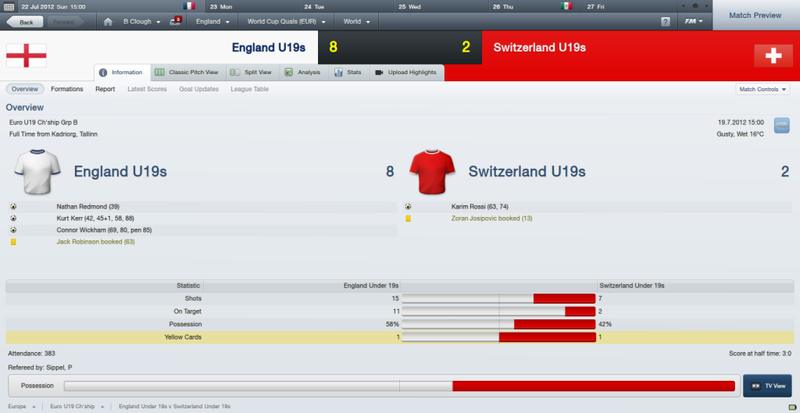 Group 7 contained the shock of the night as Liechtenstein won a match. They beat Lithuania 1-0. 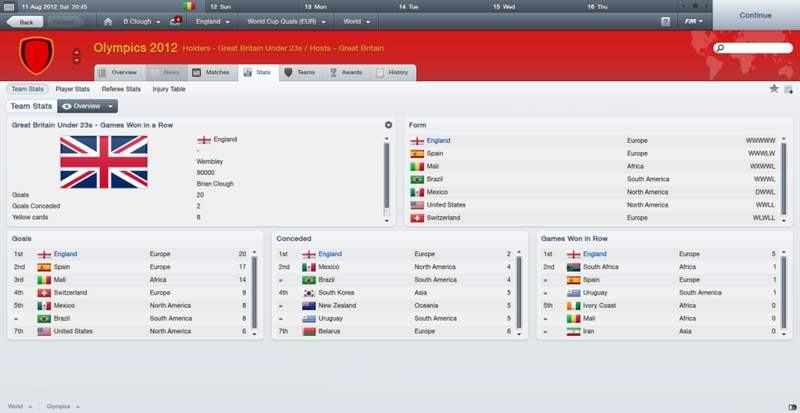 Brian Clough’s England ended the season with 2 Wembley wins in friendly matches against USA and Brazil. First up was USA. Clough gave a debut to Gordon Banks. The Chesterfield keeper was in fine form too and has probably jumped ahead of Scott Carson and Robert Green in the pecking order. The other debutant, Kieran Gibbs, also performed well at left-back and has given Clough some decisions to make. England won comfortably, 4-1 as Jimmy Greaves grabbed 2 goals to take his tally to 4 in his last 4 starts. Steven Gerrard and Stanley Matthews finished off the scoring. When Brazil arrived, 4 days later, Clough experimented with his formation and it proved to be a winning one. Second half goals from Gary Lineker and Steven Gerrard gave England an impressive 2-0 win. This was England’s first win over Brazil for 22 years. The groups have been drawn for the Confederations Cup and England will meet Brazil again, as well as Mexico and South Africa. So England has finished 2012, which must go down as one of their most successful seasons. 16 matches, 14 wins and 2 draws. Just 6 conceded too. Gibbs in the squad, didn't see that coming. Hmmmmm, not sure about that. Have you tried Lescott at LB? Oi! you pick your team, Hollers, I'll pick mine! 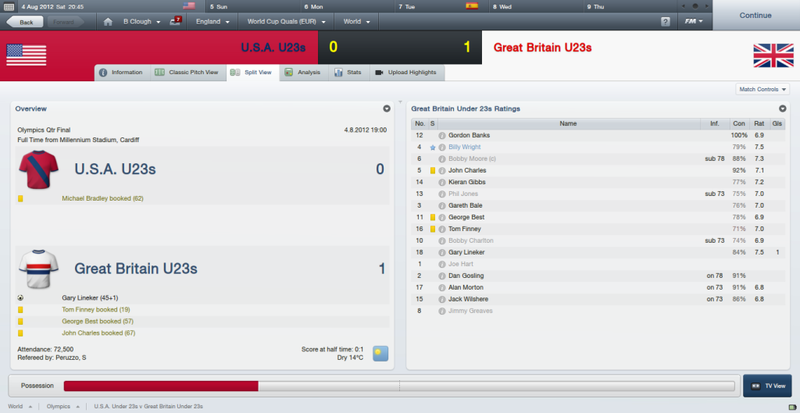 Gibbs did well in the Olympics for me, so I thought I'd give him a go in these friendlies. 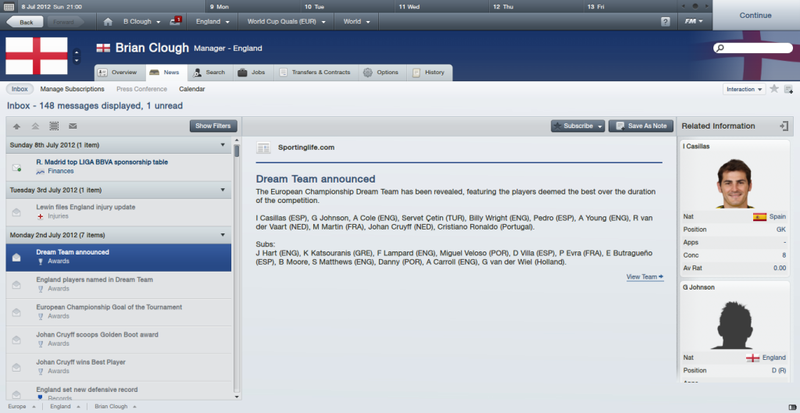 I used Lescott up to the Euros, but he got injured. Shame as he was really useful at centre or left. 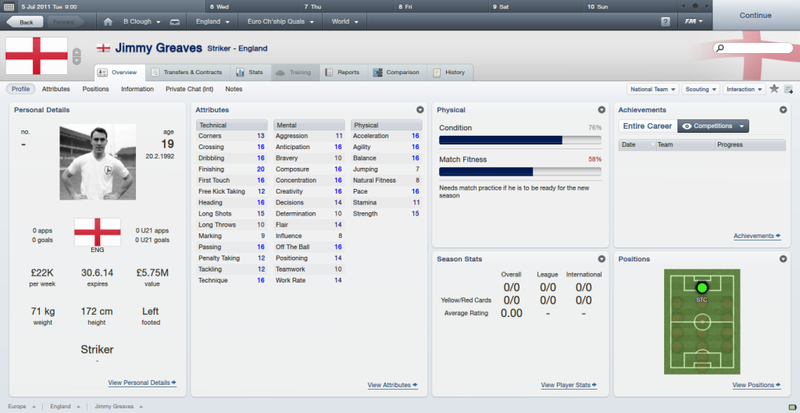 Gave me some good options, especially with Billy Wright who can play centre or right.